Tile laying: Tiles are laid at the start of the game and make every session unique. Asymmetric scoring: There are no "good" or "bad" tiles but they all score differently for different players. Hidden agendas: The players do not know how much the other players score until the very end. Guessing game: Based on how players play, the other players may gain points by guessing their agendas (or lose points by guessing wrong). Christina Regina started with the ambition to create a political game, where cards would be played to create influence. A fitting theme for such a game is court intrigues and the best example I could find from the Swedish 17th century history was the court of Christina Regina. However, I'm really not fond of card games, where a player's knowledge of cards and their effect determines the outcome, and started to think in terms of boards instead. Why not let the influence be symbolized by a Queen piece moving around on a board? With that idea in my mind, the rest went so quick that my third game was completed and tested while my second (Bellum se ipsum alet) was still being tested! The game idea is very simple. The players take turn to move the Queen and score if the Queen is moved to a tile bearing their color. There are other games with that idea, where you have to move a piece so that it benefits you more than the others. But what if the player colors were secret? And if you have an incentive to keep your color secret? That was how the assassination mechanism was born. The assassination mechanism forces a player to a careful balance: move the Queen in a way that benefits your color but not so obvious that the other players can guess the color, otherwise you will be assassinated and lose. The rule that forbids the Queen to enter already entered tiles enables a player to indirectly have the Queen moved in a certain direction without being too obvious. 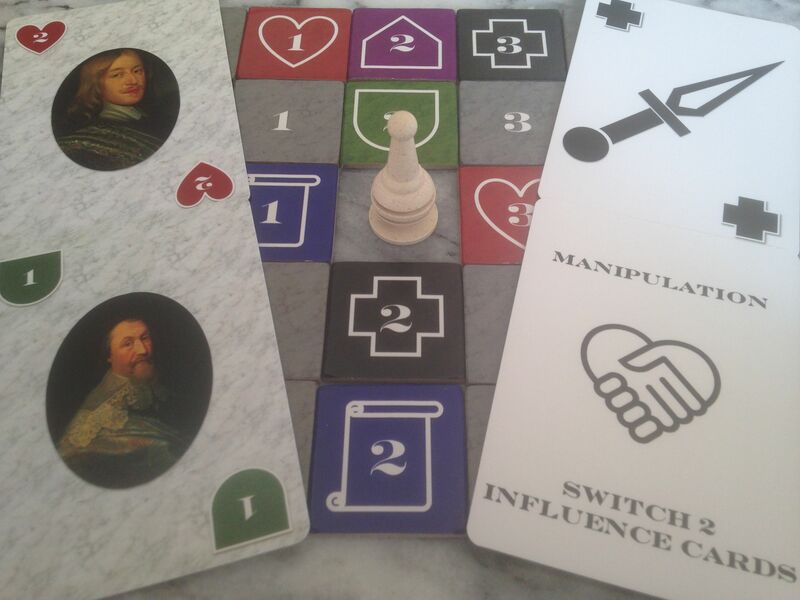 The additional mechanisms (persuasion to prevent a move in a certain direction, agitation to remove a tile and manipulation to switch two tiles) were added to provide more options than the movement but besides them, the game really does not need more. Christina Regina has the shortest playing time of my games but in spite of that (or perhaps because of that) it is one of my favorites. The simple rules have a strategic depth where everything from detailed calculation to cold-blooded bluffing may be applied. Due to its mental challenge, it may not be suited for playing several games in a row but thanks to the short playing time, belongs on the table of any game evening. The card game design started as an attempt to produce a cheaper version of the board game where the board would simply be replaced by cards. The game did indeed get cheaper but felt like a budget version of the original game. 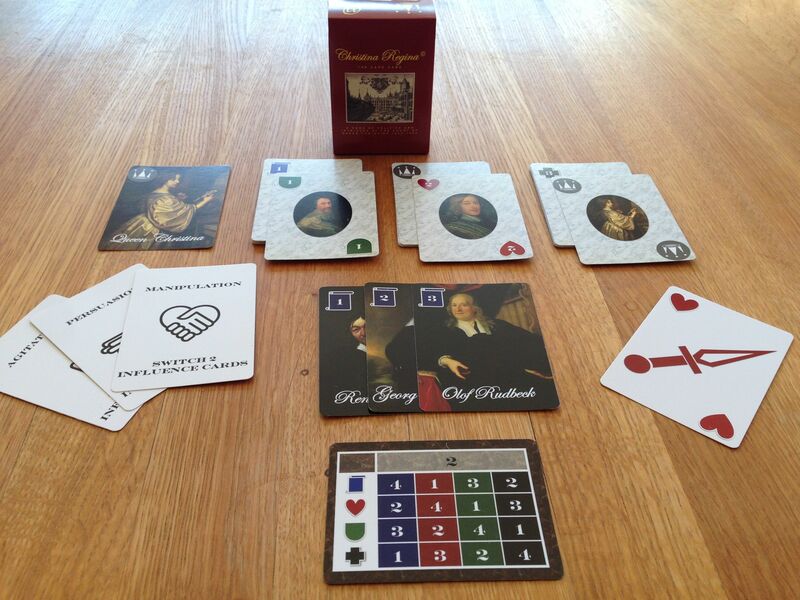 Why not try to make a real card game instead? In a card game, cards are drawn from a pile and if you come to think of it, the Queen usually has three squares to choose between (since she may not return to previous square) so why not simply replace the three squares with three piles? That idea would work for the element of picking or not picking a color but how about the element of steering the Queen towards or away colors? That was accomplished by allowing a player to move the top cards in the other two piles to the bottom. By adding the rule that the second top card would be visible as well, I could give the players the option to plan more than one card ahead, just like they can plan the board movements more than one square ahead. By that, the circle was closed. The idea started liked a card game, evolved into a board game, and revolved into a card game again! Christina Regina is quickly set up and only lasts as long as it takes to move the queen piece out of a 9 x 9 square board. The estimated playing time is only 30 minutes. A player only have to learn to move the queen piece (one square at the time), to pick up the influence tile she is moved to (and score the hidden points) and to call out any of the three special actions agitation, manipulation and assassination. A player basically has two choices: move the queen piece or call out a special action. A player only knows his or her own agenda, that is for which color she scores. The other players' agenda is completely unknown and the only way to tell is to draw conclusions from their moves. All players participate to the end. Even the concept of assassination keeps the players on the game board as they have three leaders each (although successful assassinations will be most disruptive to the victims). Well, apart from the assassination action, the players do not fight each others, only their agendas (if they have managed to guess them). The pacific-minded player may very well replace the word "assassination" with "accusation". The player interaction is subtle and indirect. When one player is in turn, the other players should refrain from interacting in order not to reveal their own agendas. However, each move will be closely monitored by the other players, both to plan their own next moves and to guess the player's agenda. There is only one piece in the game - the Queen - and the players take turns to move her. You cannot really have fewer pieces than that. As in other games in the Nova Suecia series, I have attempted to add interest through the theme and let the colorful characteristics of the past do the job for me. Please read more about the theme to get to know the influential people of Queen Christina's court. Obviously, politics and intrigues is far more complex than moving a piece and calling out actions. Nevertheless, I have been careful to add authentic characters and agendas to give the simple actions a deeper meaning. No dice. Not even drawn cards. The challenge is not to be lucky, it is to monitor the other players' moves and, based on that, guess their agendas before they guess yours. The game is not about destroying your opponents (although, as mentioned, a successful assassination may be most disruptive). Your moves and actions will inevitably provide points for everybody. Your challenge is to get just a little more point than everybody else at every time.